One beautiful sunny day, many moons ago, I was walking hand in hand with an ex-boyfriend. He lifted up one of my hands to kiss it and commented on the dryness of my hands. 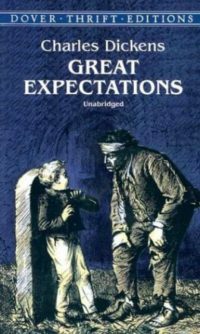 “Goodness me”, he said, (Actually it was more of an expletive beginning with the letter F! 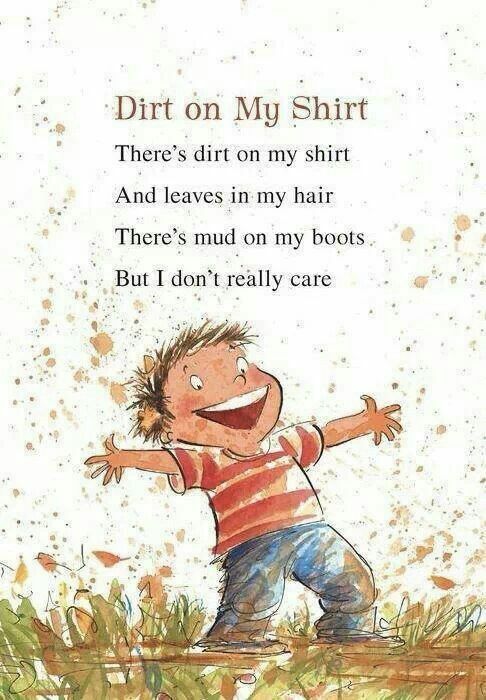 Get my drift? ) “You have builders hands!”, implying that they felt horrid to touch and as dry as a bloke’s that works all day mixing cement and laying bricks on a building site. Safe to say, he felt the back of the other one and I never saw him again. Actually I made the last bit up, but he had a point. I have always had dry hands and hand creams are a necessity in my life. Sometimes I suffer with bouts of eczema, so I have to be selective with the ones I choose. But over the years these tried and tested hand creams have become my favourites. 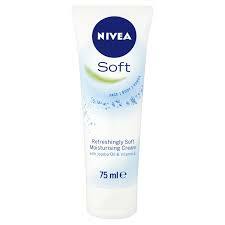 My number 1 favourite is Nivea soft which I always carry in my handbag. I have used this for years and it’s priced at only a £1 for 75ml, from most stores. 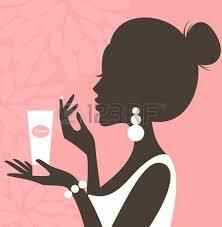 It has vitamin E and jojoba oil and smells fresh and creamy. A really lovely hand cream. This hand cream by Burt’s Bees is called ‘Shea butter hand repair cream’, and contains shea butter, cocoa butter and sesame oil. I must admit it does have an acquired smell; being quite herbal in scent. Therefore it’s not everyone’s cup of tea. It is a very nice thick hand cream though, and is very effective at hydrating the hands. It is priced at around £8. 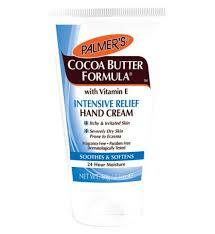 Palmer’s Intensive hand repair cream with cocoa butter is wonderful to use. It works on age spots apparently, and has a lovely cocoa butter smell, like all the Palmer’s products, and contains vitamin E. Prices are very cheap and generally range from £2 to £3. A thick and creamy texture that absorbs well. Next is the BodyShop hand cream called Shea. This smell is very popular at the moment and is included in lots of products, and I can see why. A sort of chocolatey, caramel luxurious scent. 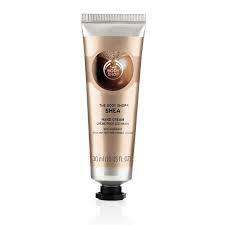 The body shop have other ranges of hand cream which are equally as nice. The cost is around £4 for 30ml. It’s quite a small tube, but the price is good. Ohh Neutrogena, lovely neutrogena…. Sorry for getting carried away, but this one saved my poor hands from an awful bout of eczema a while back. I remember popping into a chemist forlorn and depressed and placed my sore, red and itchy hands on the counter and asked the pharmacist’s advice. Could he recommend anything that would treat them and ease the pain. He advised me to try this wonderful cream and it worked at clearing up my eczema. I do understand that not all creams for this condition work for everyone, yet this one worked for me. It comes in a smallish tube, but you only need a small dab and it covers really well. Very competitively priced at around £4. Here are two more for eczema prone skin that have worked for me too. 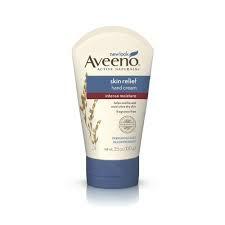 Aveeno hand cream for sensitive skin with oatmeal. Aveeno products are a little on the pricey side, but they do have a calming effect on the skin. A good cream that can give instant relief from itching. 75ml costs around £5. 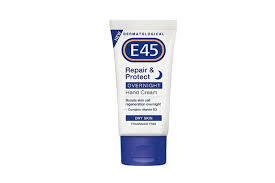 E45 has also been a tried and trusted brand for decades. 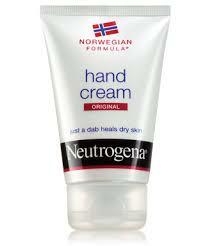 A hand cream with no scent, but it does the job by providing a soft moisturising balm for sensitive dry skin. Great stuff! 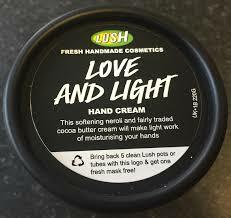 Love and Light hand cream from Lush. This is priced quite high at £8.95. I was bought this as a gift and it is very smooth with a lovely moreish smell. I feel that it is a little too expensive for what it is, yet it’s a nice cream to indulge in once in a while. Finally, a cream for the hands that is lovely to use. This one was bought for me as a Christmas present. 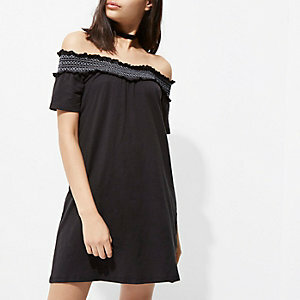 It is priced at £10 for a medium sized tube, so a little too expensive for me to personally buy, but it was bought for me as a pressie so who am I to complain. This one is called The ritual of sakura hand balm with an spf of 15. It smells of cherry blossom and has a smooth creamy sweet scent. A lovely cream. I hope this article has given you some useful ideas when buying a hand cream . I do personally feel though that the cheaper ones are of equal quality to the more expensive ones; especially the creams that are suitable for sensitive skin. Builder’s hands! 🙁 … I hope his romantic gestures have improved! !